Bernanke's tapering talk spooked investors. Investors bolted out of bonds last month, yanking a record $80 billion from bond mutual funds and exchange traded funds, according to TrimTabs. Those who fled were spooked by Federal Reserve chairman Ben Bernanke's recent announcement that the central bank could start pulling back on its bond purchase program later this year. While fears that the bond market will collapse when the Fed begins reversing its stimulus programs are overblown, Oliver Pursche, president of Suffern, N.Y.-based investment advisory firm Gary Goldberg Financial Services, says bonds are still "very overvalued." In fact, many of his firm's clients have light exposure to bonds. Pursche said it doesn't make sense to hold long-term bonds because they will lose value as interest rates rise from their record low levels. During the past two months, the iShares Barclays 20+ Year Treasury bond fund (TLT) has declined nearly 11%, while the 10-year Treasury yield has climbed to 2.5% from 1.6% in early May. "We looked at bonds and made a fairly early call that they've become a very risky asset class as a result of artificially low yields that have been pushed down by monetary policy," said Pursche, whose firm has been bearish on bonds for the past year and a half. For clients who can withstand a bit of volatility, Purshe invests in short-term bonds to dampen the ups and down of the market, but largely relies on high quality dividend paying stocks, such as Verizon (VZ), AT&T (T) and GlaxoSmithKlein (GSK), to generate income and deliver returns. Given the ultra-low interest rate backdrop backdrop, Purshe had been wondering what took so long for investors to finally start pulling money out of their bond funds, and said there's still more room to go. 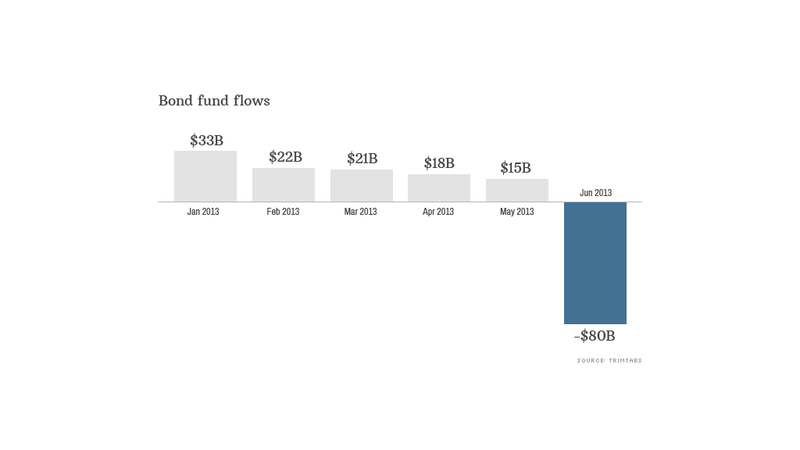 While the recent withdrawal reverses nearly three-quarters of this year's inflow into bonds, it doesn't even make a dent on the $1 trillion investors have plowed into bond funds since the financial crisis.